Greetings from Tanzania. At the beginning of 2018 we announced this as the Year of Celebrations for Priority One. There are projects around the globe that we have been involved in for the past few years that are finally coming to completion. Right now I am in Dodoma, Tanzania for two separate dedications. Below are images from the dedication celebration for the new Women's Maternity Clinic located on the campus of Central Bible College that will serve the entire surrounding community. It was a powerful moment during the dedication when the Bible college students and pastors placed their hands on the cement exterior to thank God in unity for this new facility and ask for His blessing upon this new outreach to the community. This marvelous new medical clinic was made possible by Pastor Randy Ayres and the people of Crossroads Mountain Church in San Antonio. Thank you once again for your continued support and for celebrating with us. It is with great gratitude that I send you this report from Tanzania. So often I have the privilege of seeing a project through from start to finish and experience the joy of the individuals affected by your faithful giving. I wish you could be with me in those moments to see first hand the appreciation and the practical difference it is making in the lives of students preparing for full-time ministry. 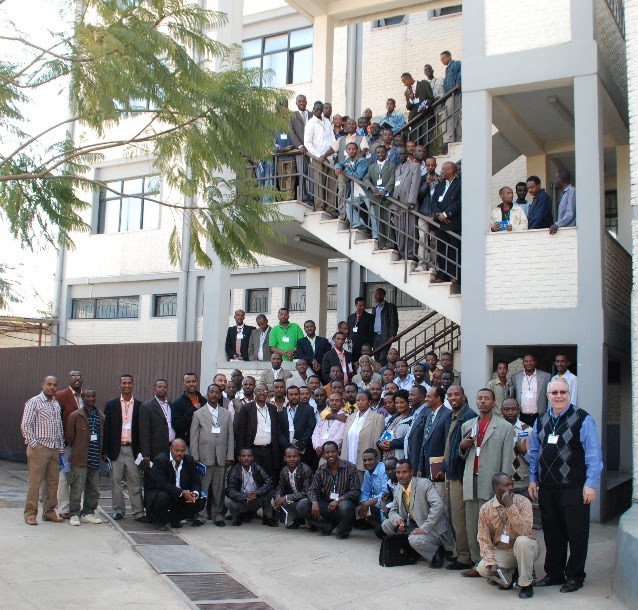 I recently traveled to Tanzania along with eight Pastors from ND, SD, MN, and WA. 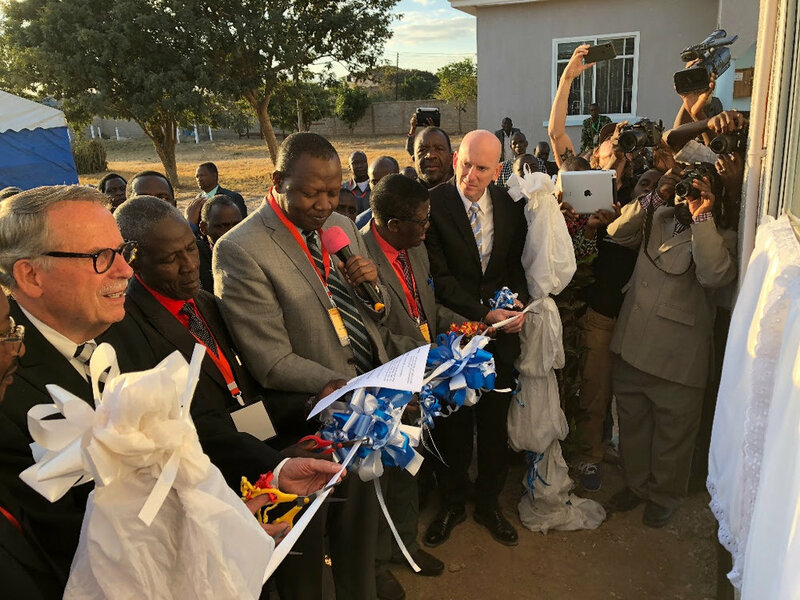 We took part in the dedication of the first phase of the Dakota Academic Center on the campus of Central Bible College in Dodoma. After the ribbon was cut, the students flooded into the new classrooms shouting, 'Thank you, America." We were honored to represent you in that moment. These new classrooms provided the greatly needed space for 225 students as the school continues to train the pastors going out to lead the newly planted churches across Tanzania. This first phase of classrooms was made possible by your generous giving. A quick update on the project in Kathmandu, Nepal. I visited the campus and spent time with the director of the college, Dr. Bal back in September. The foundation had been laid and the first floor was in progress. Very exciting to witness! Today in Nepal there are 6000 churches with one million members. The expansion of the school is desperately needed and Priority One is honored to be at the forefront of this progressive step forward. 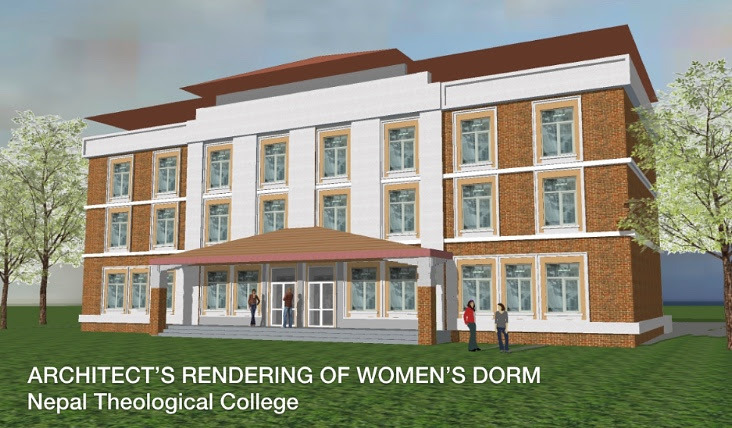 I'm thrilled to report to you great progress on the women's dorm we are helping to build on the campus of Buntain Theological College. 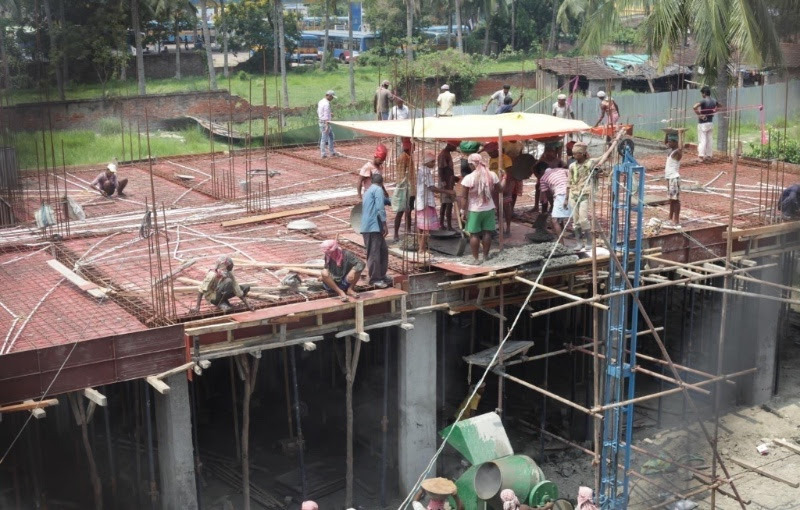 I recently traveled to Calcutta, India to check in on the project and saw firsthand the status of the three story concrete building. They surprised me by completing one of the women's dorm rooms with beds, wardrobes and even curtains. It is always so very rewarding to meet in person the students who will be impacted by the involvement of Priority One. 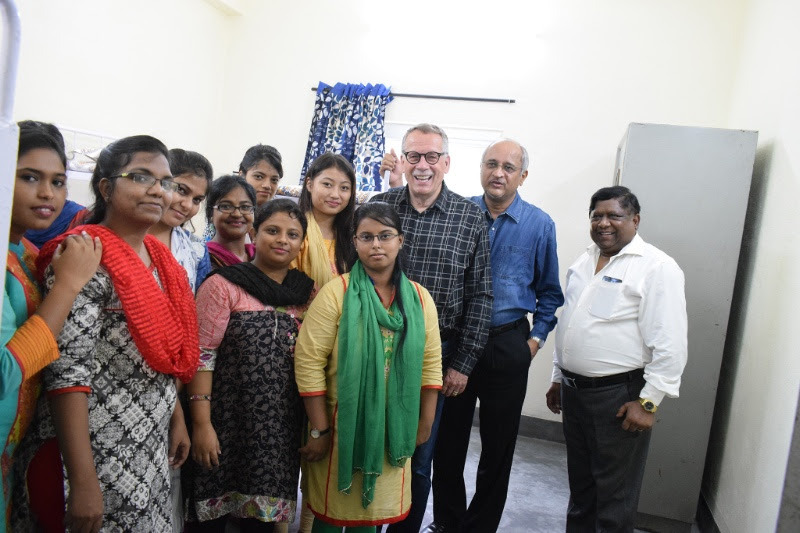 This is the only fully accredited Bible School in Northern India, servicing 850 million people. I can never thank you enough for your partnership in projects like this around the world. We may never know or understand the full impact of our efforts but we can rest in the fact that we have been obedient to His calling and that He is faithful to His word. Six months ago many of us met together in Cancun for the 15th Anniversary of Priority One. Today let me briefly share what has happened since then. Someone much smarter than I said, “you can’t manage what you can't measure.” We always visit the country and the project BEFORE we make a commitment, we visit it again DURING the construction phases, and CELEBRATE when it is finished, as we measure our success. It is for this reason and more, that this week I’m in Addis Ababa, Ethiopia with Missionary Doug Lowenberg. Twelve Priority One Partners have also joined me on this Vision Trip. 20 years ago, I went to Ethiopia to see what we could do to help Doug buy or build permanent facilities for the fledgling Bible School. The Lord helped us, and we secured a four story building that has served the AG well, with over 1000 students having graduated at a BA level. The school has now outgrown its facility and a new one is being completed to serve 1000 students. Friends of Doug have helped him immensely with this million dollar project, and we are privileged to help finish it. New pictures will be sent, but this is the latest we have. 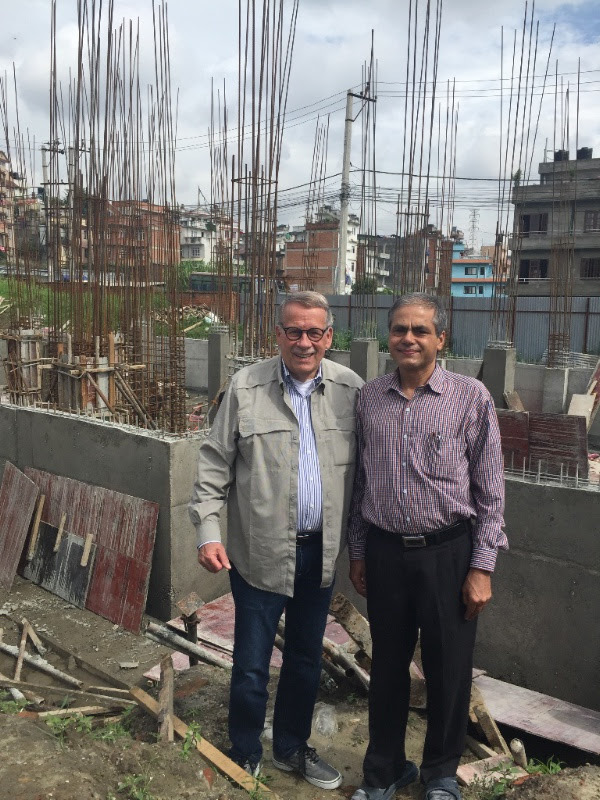 Great progress is being made in Calcutta on the new women's dorm on the campus of Buntain Theological College. 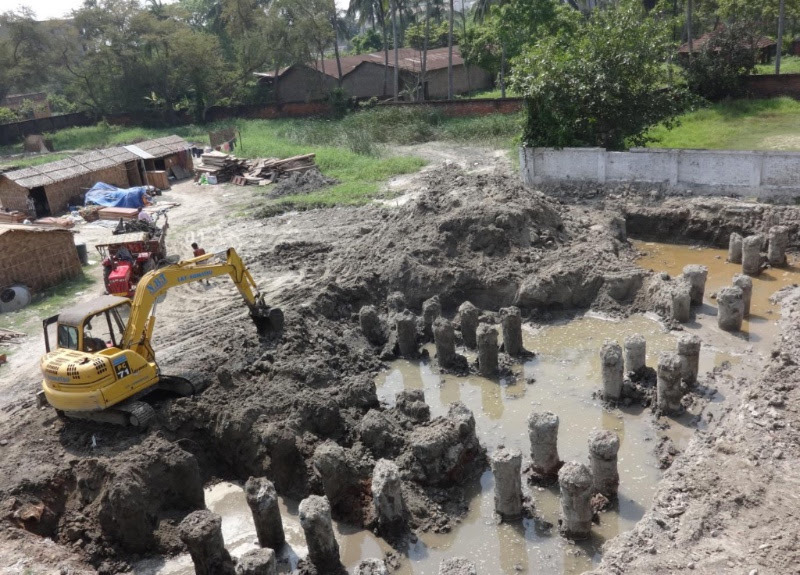 One by one the pilings began to surface for a total of 85. Each of these pilings goes 40 feet into the ground. A massive undertaking. Now comes the fun part when the building starts to take shape. There are 150 laborers working 10 hour days to pour the concrete slabs basketful by basketful - much like the bucket by bucket method they used in Tanzania. The new women's dorm will house 100 students and have additional staff housing on the ground floor. The building is scheduled to be completed in 2018 at a total cost of $750,000. Until then the female students who live off campus will continue to take public transportation one hour each way. Thank you for your ongoing support of this very needed facility. It's amazing what we can do TOGETHER in His name. I recently returned from another successful Priority One Vision Trip to Tanzania. A group of pastors and district leaders from North Dakota and South Dakota said YES and joined me in visiting the Central Bible College campus in Dodoma. The college is in dire need of more classroom space and this group committed to completing the first phase of the new Dakota Academic Center that will add three much needed classrooms. Amazing what we can do together! The team from the ND/SD AG Churches had barely left the campus of CBC in Dodoma, Tanzania, when we received this picture. The following Saturday over 50 students took their shovels, pick axes, and hoes to the place where a few hours before we had broken ground for the new classroom building. They began work at 7 am and never stopped until all of the trenches for the foundations were dug. The next weekend another group of 50, both male and female students, gathered to pour the concrete slab for the new classrooms. They mixed the cement on location and carried the wet concrete bucket by bucket to each corner of the concrete form. They repeated this arduous task until the entire slab was poured. The students continue to show eagerness and selflessness in completing projects around the campus. We love when the students are involved in the building process as they take pride and ownership in the improvements being made around campus. The building will have three classrooms, each one accommodating 75 students. The walls will go up next and we'll continue to show you the ongoing construction. This classroom building is being provided sacrificially by the ND/SD AG Districts and churches. Here are the latest images from the new men's dormitory being built on the campus of Evangel Bible Institute in Myitkyina, Myanmar. The structural part of the second floor is nearly finished with preparation for the third and final floor in progress. Buildings in this area have additional building codes due to the threat of earthquakes so this building will be incredibly solid. Thank you for your continued support to keep projects like this going. The 250 students who will live and study in this new facility will be forever grateful. 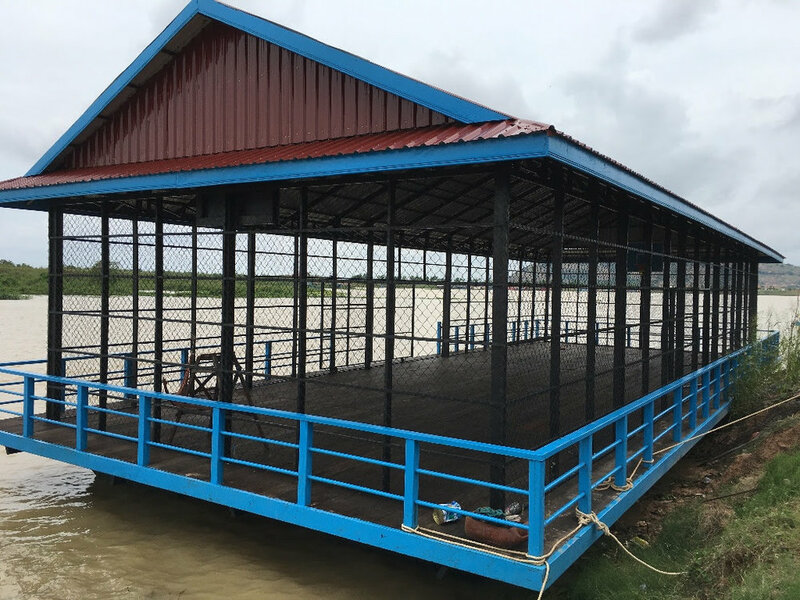 The floating gym in Cambodia is complete! The 250 students who attend school in the floating village just outside the city of Siem Reap will now have a place to run and play. When you're surrounded by water it's a challenge to stretch those legs. The teachers will thank you for helping to burn off that extra energy that has to come out somewhere. Thank you for joining in the fun of making a kid's day! With a little help from yours truly the men's dorm on the campus of Evangel Bible Institute is coming down. The old wooden building was in desperate need of replacement, built in the 60s it was deteriorating from termites and general decay. It is being replaced by a brand new building housing 200 male students studying to go into the ministry. Thanks to you and your church this is being made possible. We just received this photo from Tanzania taken from the platform by National Superintendent Barnabas Mtokambali. He sent it in a note of thanks. The white suits represent the 300 new ministers being ordained by the Tanzania Assemblies of God. God is moving in a mighty way in that nation and Priority One is privileged to be a small part it. Thank you for your generous involvement. Joyce and I celebrated 55 years of marriage and ministry this past week. I'm thrilled that God continues to bless us with remarkable health and vitality. Your love and support buoys our spirits daily and we are so very grateful. Because of your faithful giving, this year we have helped our Bible Schools in Algeria, Bangladesh, Cambodia, Colombia, Myanmar, Mexico, Nepal, Philippines,Tanzania, South Africa, Vietnam, and Trinity Bible College in Ellendale, ND. I have travelled all over the United States and twice to Africa sharing what God is helping us to do all around the world. Praise His Name! A team of Priority One representatives were recently in the capital city of Dodoma for the dedication of the new Crosby Clinic. The community celebrated as members of local government and the medical society were present to give their endorsement of the new facility. This new clinic located on the campus of Central Bible College is now open to the public and is serving as a new outreach to the surrounding population with much needed medical care. A doctor’s residence was also built next to the clinic to allow for a full time doctor on the premises. "It's a real privilege to partner with such a strong national church and provide quality facilities for training their next wave of leadership. And it's also a blessing to have a quality liaison in the person of missionary Joel Hayes." "I was impressed with the national church and how they have thrived and grown for the glory of God in a difficult political situation without the help of the foreign missionaries who had been expelled since 1966. They are committed to training pastors and only lack funds to make it happen." "It was great to see what God is doing in that part of the world and great to get to be a part of it." "The trip opened my eyes to the power of the gospel working in the hearts of His people in SE Asia." I've just returned from Cambodia, with Brad Rosenburg, Brian Campbell, Aaron Cole, Darin Poli, Jason Hirsch, Randy Young, and Chip Johnson. We helped Dareth Ly dedicate his new Promise Kids School for 175 children. Dareth says "If there's not a generation serving the Lord, let's raise one up”. He is doing that through the 3000 children in his schools, who hear and read about the love of Jesus Christ every school day! What a fabulous facility these children will have. On my way home I received a phone call from a dear friend assuring me that the final $15,000 would be provided to finish the kitchen for the school. Now we can say: IT'S ALL PAID FOR! We also slipped into Vietnam and found key opportunities to build training centers in areas previously forbidden. More on that later. Now, as another wonderful year draws to a close, Joyce and I wish you and yours a very Merry Christmas and a Happy New Year. May God grant to all of you His Blessings this year! You are deeply and sincerely appreciated.